Upon returning to the United States from Venezuela and reading the terrible media reporting of the election, it was evident that the people of the United States are being lied to. The Intrepid News Fund and Venezuela Analysis invited me and others to come to Venezuela for the election to see first hand what actually happened so we could report what we saw and break the media blockade against Venezuela. 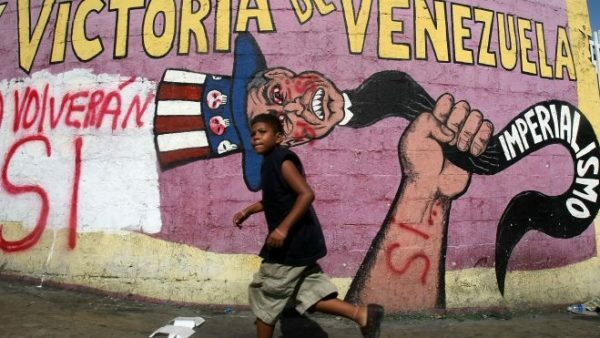 The US is leading an economic war against Venezuela that is causing tremendous damage, but there is also a media blockade preventing the truth from being told. Mayor Carlos Alcala Cordones of Vargas, speaking to foreign delegations, told us the media blockade was more damaging than the economic blockade. In reality, Venezuela had free, fair and transparent elections and manages the most sophisticated and accurate voting system in the world. Former President Jimmy Carter, whose Carter Center has a Democracy Program, said, “As a matter of fact, of the 92 elections that we’ve monitored, I would say that the election process in Venezuela is the best in the world.” This is consistent with others who have monitored Venezuelan elections. In the recent election, there were 150 international observers from over 30 countries who also noted the advanced nature of the election system and validated the results. Despite the boycott, Maduro received the vote of 28% of the eligible electorate, around the same as Barack Obama received in 2008 and more than he got in 2012 or Trump in 2016. The 46% turnout is similar to US turnout and much higher than countries like Chile and Switzerland. The economic punishment is not related to democracy. There is no economic blockade of Honduras, where a coup was followed by questionable elections, or Brazil, where there was a coup, or Saudi Arabia, a monarchy without national elections. Granma, the official voice of Cuba, which has a lot of experience with US economic war, describes ten examples of efforts to destabilize the government since the election. The people of Venezuela are suffering from serious impacts of the economic war being fought against them. The US sanctions combined with the drop in oil prices has sent the Venezuelan economy reeling. This election was important because Venezuela withstood the attack of the US and western powers, who refused to accept the election and tried to oust Maduro. When the Bolivarian Revolution had money from high oil prices, it was used to improve the lives of the poor. The results were marked decreases in poverty and illiteracy and increased access to health care and housing. The economic war has put stress on all of these programs, but Maduro persists despite it. One of the great successes of the Maduro era is the Housing Mission, which built two million homes for the poor. Each home houses four to five people, meaning eight to ten million people received housing, which included furniture. This is quite an accomplishment in a nation of 32 million people. The program began in 2011 after there were devastating mudslides and hopes to reach 3 million homes by 2019. Compare this to the United States, which is in a housing crisis, where the 2,461 people are evicted every day, and poor and middle-class families are housing-insecure. Consider the US response to the storms in Puerto Rico, where nine months later the island is still in crisis, or cities like my hometown of Baltimore, where we have thousands of homeless and 16,000 abandoned homes. The economic sanctions are creating food shortages in Venezuela with blockades of food and medicine purchases and with some wealthy Venezuelans adding to the problem by hiding food or sending it to Colombia. In response, Maduro announced an expansion of the Local Provision and Production Committees (CLAPs), to distribute food to six million people. The Bolivarian Revolution is seeking food sovereignty in response to the injustices of the global food supply system, a goal made more difficult but also more essential due to the economic war. Food production is a long-term problem in Venezuela due to its oil-based economy, which caused farmers to move to urban areas in the 20th Century. Maduro has also fought off agribusiness by banning GMO’s and the privatizing of seeds, protecting indigenous food knowledge from corporate capture and seeking to create a democratic food system. Venezuela is an example of ecosocialism, where food systems are socialized and developed in an economically sensible and sustainable way. These are just some of the social programs that Venezuela has sought to expand under Maduro. Maduro has also tried to break the financial blockade with oil-backed cryptocurrency. US sanctions have had the effect of causing the people to blame the United States and unify around Maduro and the current government. US leaders and the media describe Maduro as a dictator. It is absurd on its face when the election history of Venezuela is examined. Not only does Venezuela have lots of elections, but it is seeking to develop participatory democracy at the local level. The Chavistas have won almost all elections since 1998, but lost two national elections. In 2007, the opposition defeated Chavez-supported constitutional amendments. In 2015, the opposition won the national assembly. In the last presidential election, Maduro narrowly defeated Henrique Capriles by 1.49%. This history shows consistently free and fair elections, not a dictatorship. The National Constituent Assembly is pointed to as an example of dictatorship. When the opposition won a large majority, they showed their true colorsby removing portraits of Hugo Chavez and Simon Bolivar. Then they passed an amnesty law for themselves where they listed all 17 years of crimes in seeking to overthrow the government. This law was found unconstitutional by the court. The opposition promised removal of Maduro within six months and incarceration of Chavista leaders when they took power. Violent opposition protests followed that led to over 125 deaths. The Supreme Court found that three of the right wing legislators were elected by fraud and until they left, the Assembly could not act. The Assembly refused the court’s decision and in the midst of a stalemate, Maduro used his constitutional power to activate the National Constituent Assembly. The opposition tried to block the vote and 200 polling stations were besieged on election day, but it went forward. Chavistas were elected but the opposition claimed the turnout of over eight million voters was “too high” to be credible. The National Constituent Assembly has an interesting democratic makeup. Two-thirds of the members are geographically based and one-third represent different constituencies, including trade unions, communal councils, indigenous groups, farmers, students, disabled people, and pensioners. They are currently writing amendments to the constitution, which will be voted on. The communal councils show the participatory nature of Venezuelan democracy. The 2006 law on Community Councils allowed groups of citizens to form Citizen Assemblies that represent 150 to 400 families in urban areas, 20 families in rural areas, and 10 in indigenous communities. More than 19,000 councils have been registered. They elect their leadership, meet and decide on projects needed for the community. They have received $1 billion in funding for various projects and have established nearly 300 communal banks, which provide micro-loans. Communes are combinations of local councils that work on larger projects. These councils are the frontline of participatory democracy, but are ignored by the western media, as they are inconsistent with the claims of ‘dictatorship.’ For the Bolivarian Revolution, the councils are intended to ultimately replace the democratic liberal state by bringing together citizens, social movements, and community organizations, to practice direct participatory self-governance. They are a main pillar in the transition to an ecosocialist, communal state. They are a work in progress, striving toward these goals based on a belief in the sovereignty of the people, which take on more functions of the public sector as they demonstrate competence. Maduro recognizes Venezuela is still a capitalist-based economy and has identified the commune as the centerpiece of democratic socialist governance. The example of creating real democracy, working to break from capitalism and moving to a socialized economy by and for the people, is what the United States and oligarchs fear. That is why Maduro is called a dictator and the US calls for a military coup “to restore democracy”, which really means restore the pre-1998 oligarchy and protect capitalism. The presidential election, originally scheduled for the end of 2018, was moved up to April when the US State Department, OAS Secretary General Luis Almagro, other regional conservative governments and opposition parties called for 2018 presidential elections to be brought forward. Then, they claimed April was too soon. To appease the opposition, the government agreed to move the elections to May 20, signing an agreement with right-wing candidates Henri Falcon and Javier Bertucci that included a host of electoral guarantees. Despite this, the US and its allies said the elections were illegitimate. 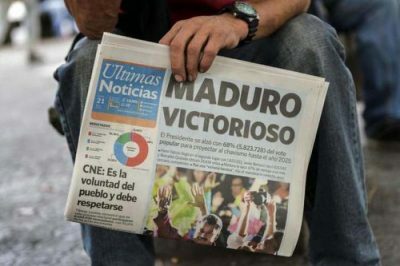 In the end, the elections went forward and Maduro won an easy victory. While Maduro won the election against Venezuelan candidates, he was really running against US imperialsim. Maduro overcame great challenges to win a mandate to continue the Bolivarian Revolution. After the election, he urged dialogue with the opposition, seeking to move Venezuela to peace. Maduro also ordered the US Charge d’Affaires Todd Robinson and head of political affairs (who he described as the head of the CIA), Brian Naranjo, to leave Venezuela. He accused them of being involved in “a military conspiracy” against Venezuela. This is consistent with calls for a military coup by former Secretary of State Tillerson and Senator Rubio as well as Trump’s claims of a military option for Venezuela. Maduro must confront the economic war and build an independent economy, alongside and often led by the communes. Grassroots activists are calling for a National Emergency Plan on food, the electric system and Internet, health care and education. China and Russia recognized Maduro’s victory. He needs their support for major projects. Maduro and the Venezuelans still face significant obstacles. The internal traitors, who seek a return to the pre-Chavez era, have been exposed as more loyal to the US and international finance than to Venezuela will need to be held accountable. The problems of corruption and crime will continue. And, Maduro will be under threat of attacks from US-allied Colombia and Brazil. To show solidarity, people in the US should call for an end to sanctions and threats of regime change in Venezuela. Let Venezuela be independent and pursue its Bolivarian revolutionary path. We may learn something about democracy from them.